Finally, after keeping the fans on their toes since last night, Ram Charan has just announced the title of his ongoing village entertainer in Sukumar’s direction. 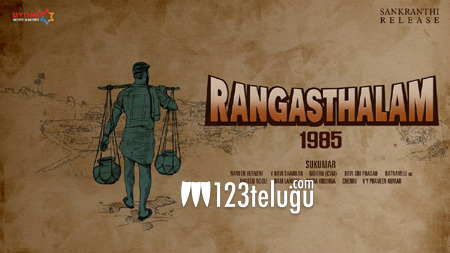 The film has been interestingly titled Rangasthalam 1985. Going by the title, it looks like the Charan-Sukumar combo is coming up with an intense period drama. Ram Charan has also announced that the film will hit the screens during Sankranthi next year. Samantha is the film’s leading lady. Prakash Raj, Jagapathi Babu and Aadhi Pinisetty will be seen in important roles. DSP is scoring the music and Mythri Movie Makers banner is producing this high budget entertainer.